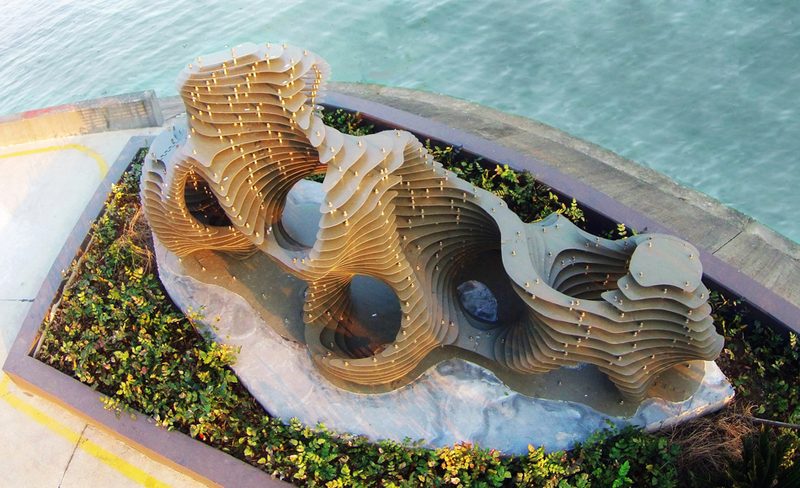 The installation is built on the side of Taihu Lake at Yixing. The team developed a computer program to simulate the complex geometry of Taihu stones, which has been widely recognized as an essential symbol of Chinese traditional aesthetics. This design combines the Gyroid minimal surface and the meatball algorithm to create a complex geometry full of irregular holes similar to that of natural Taihu stones. Modifying the positions and the radiuses of the metaballs in the program will immediately lead to new results. The installation is realized by layering steel panels. All the steel components are cut by laser cutter. The geometry of each layer, the subdivision of components and the shape of connections are all generated by the computer program. 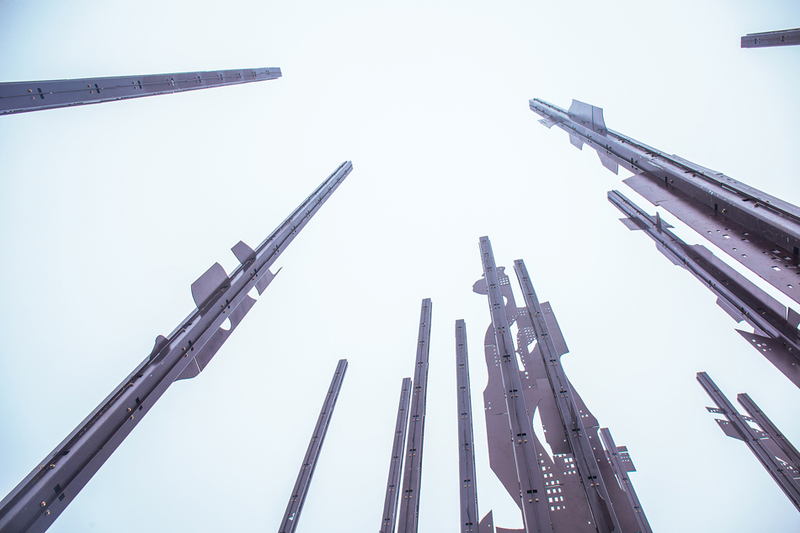 The dimension of the installation is 7.5m×2.8m×3.2 m. It consists of 177 steel components and 1060 bolts. The head run of the laser cutter is 802m. Laser cutting takes three days, while the in situ assembly takes two days. 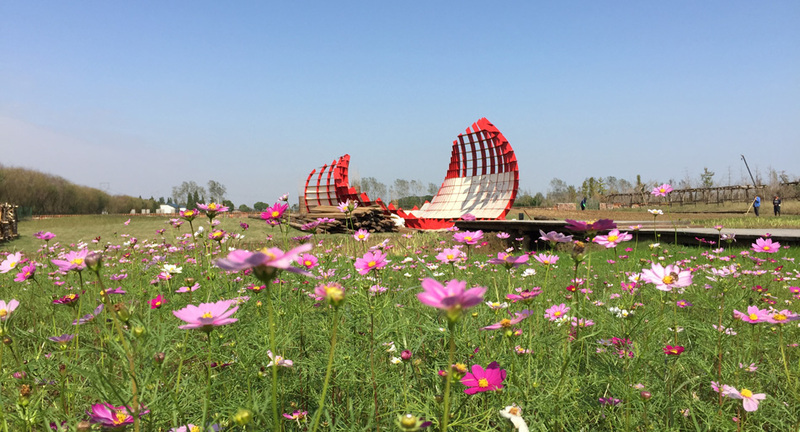 The “Dragon Boat Memory” installation creates a unique landscape on the side of Taihu Lake at Yixing. The shape of the installation is modeled by a NURBS (Non-uniform rational basis spline) surface whose control points are located on the site. 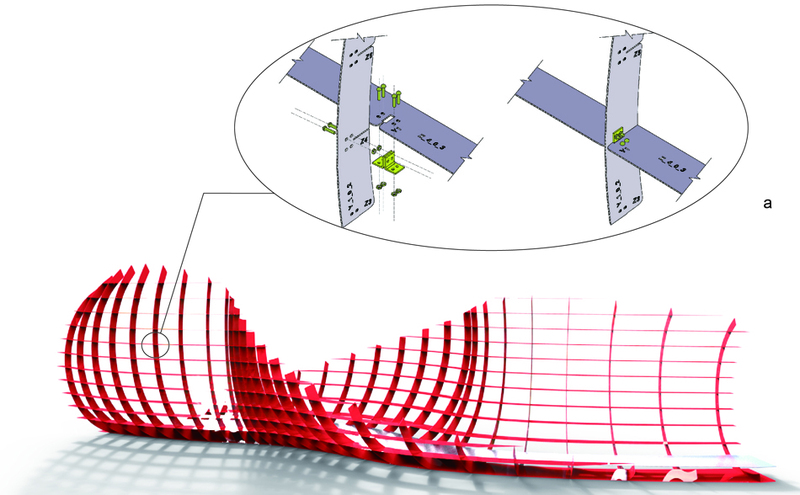 The team developed a Java program to create the geometry of the installation and produce all the data for digital fabrication. The installation consists of a structural framework and punched panels attached to the framework. The framework comprises of horizontal and vertical beams which are interlocked by each other. The beams are made of galvanized steel (5mm thick). The punched panels on the installation’s surface create an abstract image of a local traditional painting. These panels also enclose an amusing passage for the visitors. The planes are made of 1.5mm aluminum panels. Both the framework components and the punched panels are produced by a laser cutter. 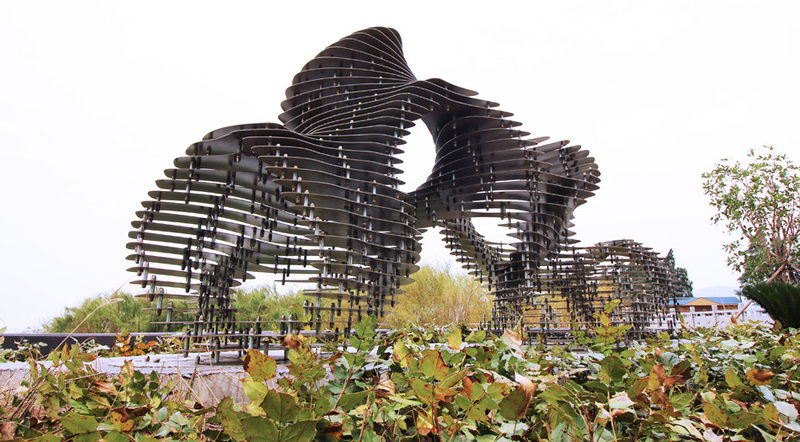 “Sparse Shadow” is located on the Greenway of Taihu Lake at Yixing. The pedestrians will observe the distinct aspects of the artwork when walking around the site. Several images are transformed and combined into the 3D volume of the installation. “Sparse Shadow” consists of 17 columns and 498 metal pieces that deliver a dynamical visual effect. The computer program first transforms the original images into bitmap-like layouts; then several layouts are superposed within the installation’s volume and the visual quality is optimized; finally, the computer program creates the data for laser cutting to complete a digital chain from design to production. September 21, 2017 | Filed under Others.